Successfully Added Mini Aquarium - Holiday Theme Desktop Ornament to your Shopping Cart. 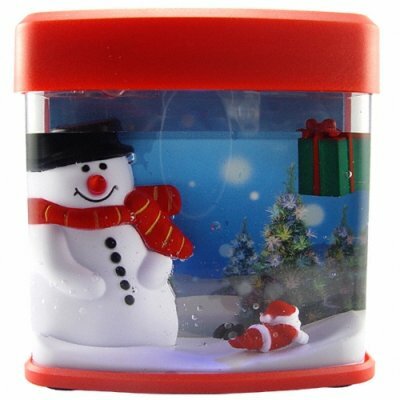 Small USB or battery powered Christmas holiday desktop aquarium. Want to bring a little bit of the holiday spirit into your workplace or home computer desk? There is no easier way than with this handy little Christmas themed mini aquarium. All that is needed is a simple USB port to plug into (or AA batteries) and you can start making the holiday come alive. When powered, the water slowly cycles through to keep the two holiday ornaments inside moving around and the additional blue light can be turned on to enhance the aquariums beauty. A simple way to put some holiday fun into your piece of the world. Offered to you at a low wholesale cost and with no minimum order quantity (M.O.Q.). From the leader in unique direct from China electronics, Chinavasion. Mini Aquarium for desktop, reception counter, gift table, etc. Aquarium has Frosty Snowman character and floating ornaments. Blue holiday colored LED light can be turned OFF/ON to enhance the aquariums beauty. Small enough to be placed on desk, shelf, counter top, nightstand, etc.